Developing quality instructional materials isn't easy. All teachers deserve access to well-organized, high-quality resources they can use to meet the daily needs of their students. More than just writing lesson plans, developers organize and sequence learning goals and instructional ideas into classroom activities and routines for teachers and students. 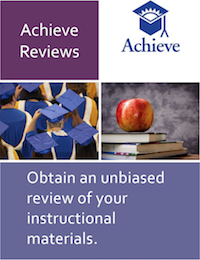 Achieve can help by providing an unbiased review of your materials using our EQuIP Rubric for Science. Reviews carefully detail the evidence for how thoroughly the materials are designed for the Next Generation Science Standards (NGSS) and include suggestions for making them even more so. Our goal is to help the science education community understand what the NGSS look like in practice and to help the field define and describe these standards. For that reason, our reviews are free for instructional materials that are free and open to all educators. For proprietary materials, we will charge a fee based on our internal costs to conduct a review. High-scoring products will be highlighted on our website; all other reviews will be confidential. We are uniquely positioned to support the creation and adoption of aligned materials as we coordinated the development of the NGSS and actively support educators across the country with standards implementation. We are broadening our reach to identify more high-quality materials designed for the NGSS. We hope the reviews will help both those developing materials - whether in the classroom, a university, or a publishing company - and those looking for quality materials to support implementation. These reviews typically take 8-10 weeks, but may take longer depending on the volume of reviews that have been submitted and the length of the materials to be reviewed. Instructional materials are reviewed in the order they are submitted. High-scoring instructional materials will be featured on the Achieve website; all instructional materials will receive confidential feedback and reports. There is no cost for this service; these reviews are covered by grant funding Achieve has received. For materials that are slated for revision, or under development. The review process here is similar, but with more in-depth suggestions for improvement that focus on things the developer might consider during revision. A typical unit review time is 4 weeks. The entire review is confidential. A fee will be incurred based on the amount of content to review and the timeframe desired. For materials that will not be freely available to the science education community, and thus will only be illustrative to the field if they earn the highest distinction. High-scoring materials, with the author's permission, will be featured on the Achieve website; all review materials will be confidential. Additionally, Achieve now offers an NGSS Design digital badge as an option for developers who have had their materials reviewed through the Achieve process. This badge can be used in marketing and promotional materials associated with the product in question. For more information, please visit the Achieve website at https://www.achieve.org/reviews or email us at ngss@achieve.org with the subject "Instructional Materials Review."